If I were to do that, which parts do you think I would need? Again, sorry for the ridiculous amount of questions! Perfectionist at work. Haha. They were 125-degree pipes and the length of each pipe was 600mm. I had to cut them down to fit though, so I didn't use the full 600mm of each pipe. You could make it out different angles of intercooler piping, but that means you'd have to have more joiners. I had a look at that site, but the piping seems far to short. The amount of joiners would be crazy, lol. I'm sure you'll be able to find some 125-degree somewhere. If worst comes to worst, you could always get a straight pipe bent slightly. Try calling performance shops and exhaust shops. No worries about the questions, glad to help. False. A dirty air filter will NOT harm the fuel economy on a modern fuel injected vehicle with a closed loop feedback signal from an O2 sensor. The O2 sensor assures the vehicle is running at the correct stoichiometric air fuel ratio (14.7). 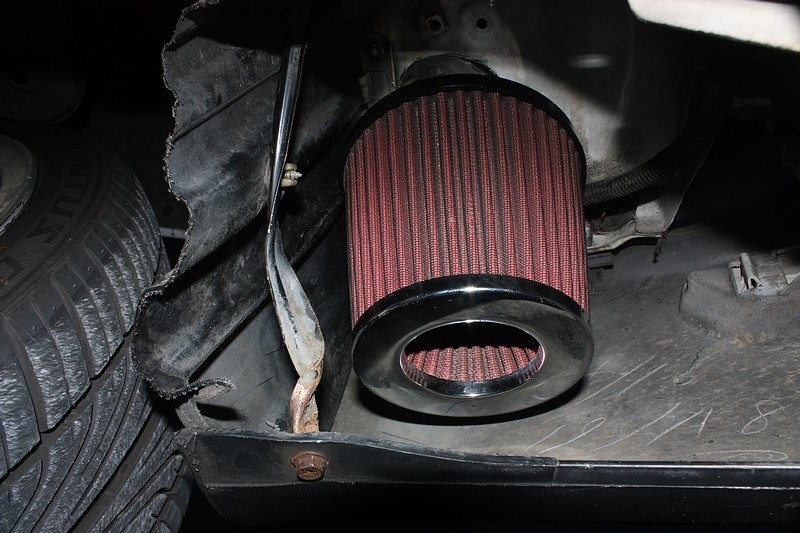 Just because your filter is dirty doesn't mean your engine is getting less air or more fuel. The air/fuel ratio is the same. All that happens when your filter is dirty is the filter has a larger pressure drop across it, so in response, the throttle body butterfly valve opens a little further creating the EXACT same power at the EXACT same air/fuel ratio. Now, fuel throttle, peak horsepower is a different story, where a dirty filter will reduce power. Replacing the engine air filter improves efficiency: This was true when most engines had carburetors. But modern fuel-injected engines have onboard computers that adjust the fuel-air mixture. Changing a dirty filter won’t improve fuel economy but might improve the engine’s performance. Just saw this post. Nope, it doesn't get dirty. I recently replaced the pod filter with a higher flowing one and the old one was barely dirty at all. You could still see through it when holding it into the sunlight and it looked almost as good as new. It was on there for around 6-months in all types of weather conditions. The pod filter can't really get dirty down there unless you follow right behind someone on a dusty road, although even then, the dust will more than likely rise into the air as opposed to going under the front bumper. The wheel-arch splash tray stops any dirt/dust getting on it from the front wheel as well. Also, I just noticed a typo in one of the posts I made in this thread. The alloy piping I used was actually 135-degree piping, not 125-degree. Not that it matters, but worth mentioning if someone wants to create the same set-up. i just recently got a short ram intake from my car too off ebay and we put int he sensors right and put breathers on and all but for some reason the car just turns off and we believe it's a problem with the sensor but when we put it onto the stock filter the car runs fine i drive a 2010 corolla s btw anyone thinks they have an idea?